We could take this very nice quote from Lieutenant John E. Reilly's diary and call it a day. But this is Joshua Lawrence Chamberlain we are talking about and if his middle name wasn't "Joshua," it would be "controversy." Now don't let that last comment of mine hurt your brain too much, we are going to need it for the many paragraphs yet to come. I know before we look at anything else, you are going to want to know what Ellis Spear has to say, so here it is. Well we lucked out, it looks like we caught Ellis Spear in one of his better moods. But now let's press on to other more reliable sources. The map to the left was printed in the "Atlas to Accompany the Official Records of the Union and Confederate Armies." On this map north is the top left corner of the map. If you rotate this image about 90° to the right you will start to see landmarks such as Jerusalem Plank Road (now Crater Road) the Norfolk and Petersburg Railroad and Poor Creek begin to line up with the Petersburg locations on the modern map above. The blue markings are my understanding of the 5th Corps positions on June 18th and the black cannons are my understanding of the artillery positions. 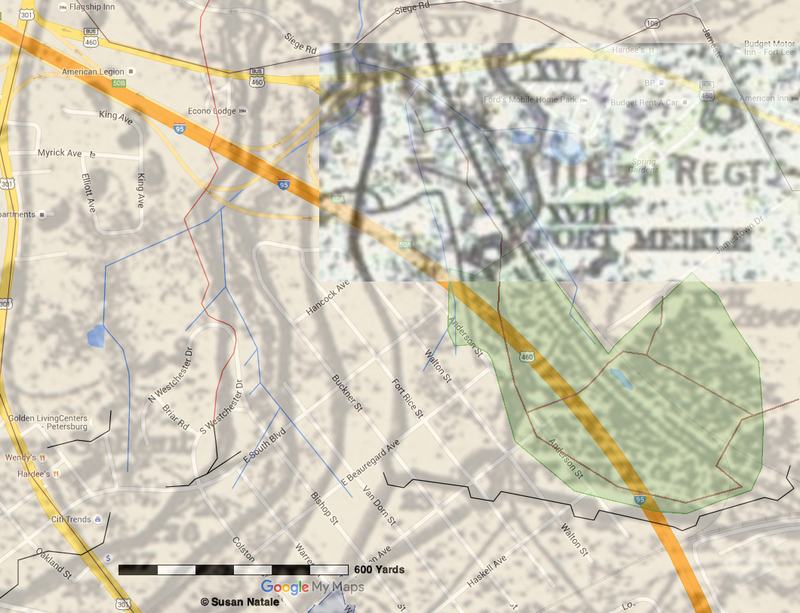 The thin red line original to the map is the outer line of Confederate earthworks protecting the city. These outer works, except for Rives Salient and Fort Mahone, were vacated as the 5th Corps moved in on the morning of the 18th of June 1864. The Confederates retreated to a line (drawn on with a thick red line) that was parallel to Jerusalem Plank Road or modern day Crater Road. Fort Mahone is labeled battery 29 on the map. Fort Sedgwick (also called Fort Hell) would later be built on the hill in front of battery 25 and run across the Jerusalem Plank road on its left side. The location was probably near the "Je" in "Jerusalem" on the map. Where it ended on its right side is harder to determine but it appears it is somewhat inline with the end of Rives Salient. 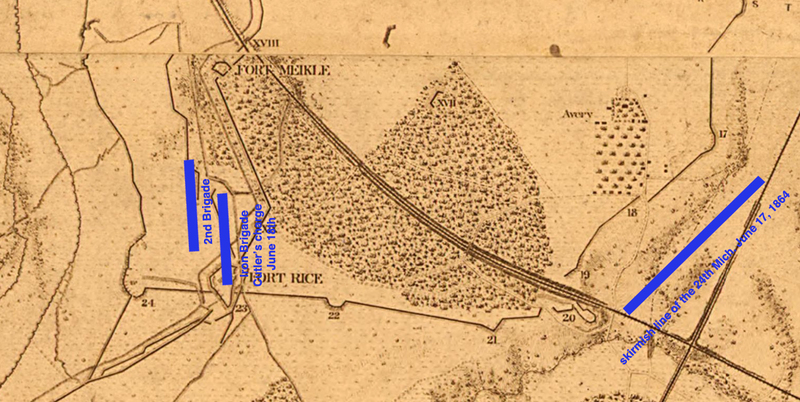 Fort Rice would be built about where battery 23 appears on the map. As we gather together all the accounts of June 18, 1864 we begin to find a large amount of the participants suggesting that they were at the future site of the Crater. Men from the 9th Corps as well as many from the 5th. We can see some from Chamberlain's own men claiming the same here, History of the 150th Regiment and here, Two Reunions 142 Regiment Pa. Vols. All these accounts are very compelling. But were all these men there that day as they say? Did they perhaps make sharp turns in front of other divisions rushing to claim the prize that would be the future site of Crater? Were some just lying? Those of you who have read “Hitchhikers Guide to the Galley,” know that the guidebook to the universe has printed on its cover in large letters the words, "don’t panic." These words might also be well served on the covers of primary sources. The documents you are going to look at are going to be flawed. People are going to state things that are not true; your heroes even might state things that are not true. But remember, don’t panic. Keep in mind that terms given to places after the participants left like, “The Crater” or “Fort Hell” are much less likely to point you to the actual true locations of where the events took place. Hearing these terms after the fact the participants have added them in their story, but they might be wrong about that. What doesn’t lie are the landmarks they witness. Keep close watch on these landmarks. Of course now looking at old maps you are going to find the landmarks slightly different on this one or that. Again, don’t panic. As you look over many different maps you will start to see what they agree on. You might be starting to feel a little dismayed that a hero of yours has stated something wrong, well don’t, because they are not alone, you are going to find just as many mistakes made by the next guy. The more you look at sources the more errors you will find. It doesn’t mean these people were trying to lie to you, it just means they made a mistake. Keeping all that in mind, especially the don’t panic part, lets have a look at what the sources are saying about their location on June 18, 1864. Before we get started I would like to draw your attention to one account among many that mention the future site of the crater, as this particular account has been confusing historians more than the others it seems. This account comes from men in Cutler's division. At three P.M., this new line was attacked by the whole corps, the Fifty-six charging at a point a quarter of a mile south of the site afterward selected for the mine. [...] Firing was kept up by both parties, at intervals, until July 31st, when the mine was exploded. I suppose historians, more esteemed than I, know where a mine was exploded on July 31st and therefore know exactly where Cutler was. But since I only know of the July 30th mine, I am going to toss this into the pile of everyone else who mentions the Crater and move on. As far as accounts that mention the Crater go, this one seems to be one of the less credible. We have plenty more to look at, so we should press on. I will keep my commentary to a minimum as I believe the sources speak for themselves, but I will put in bold some of the landmarks as they are mentioned to better help you keep track of them. "On June 18," says General Willcox in his official report, "at about 4:30 a.m., I was ordered to move forward again and attack. A party of skirmishers was sent out in advance to feel for the enemy, and reported that the latter had fallen back, and with skirmishers deployed I moved on Hartranft's brigade in front, across the fields and into the woods, toward the Taylor House." 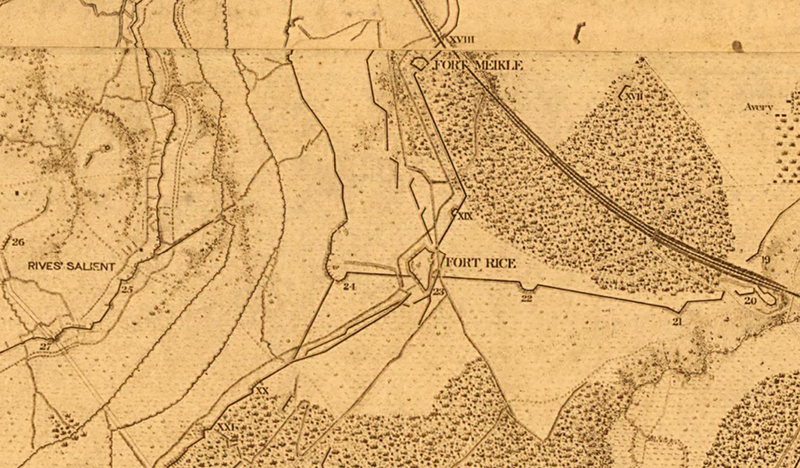 This was the "belt of woods" so often mentioned, just east of the site of Fort Morton. The "Taylor House," it should be explained, stood near the site of Fort Morton, north of the Norfolk Stage road, also known as the "Baxter road," which came up the hill a little south of Fort Morton, and passed along the south end of the "belt of woods." The "Taylor House" site was a commanding position, and the ground sloped rapidly to the westward - toward the city - the line of the Norfolk and Petersburg Railroad, making a deep cut along the lower face of the slope. At the foot of the hill flows "Taylor's Creek" and about 175 yards beyond it, on the opposite slope, was the new rebel line. 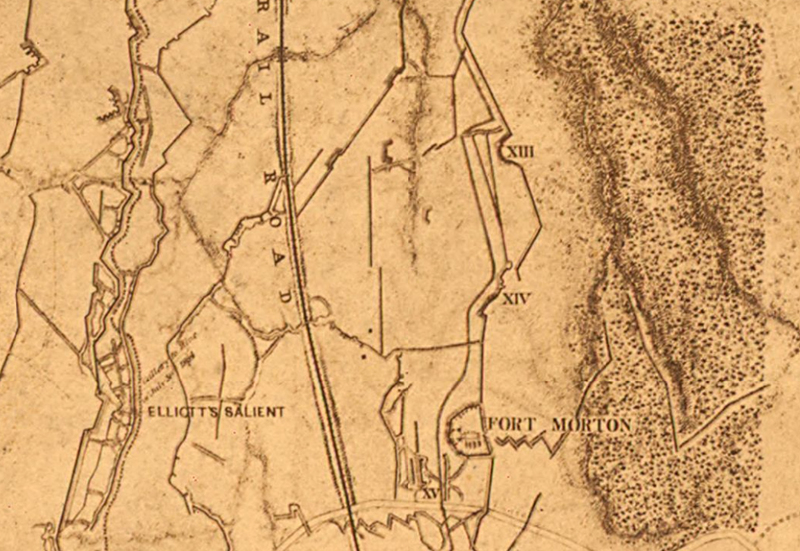 This line had been skilfully laid down, so that this whole railroad cut was swept and enfiladed by both musketry and artillery, from a point a few hundred yards to our right, near the railroad bridge across Taylor's Creek. Major Grant's report of this day's operations is incorporated in full in Colonel Cutcheon's regimental report, which will be found in the appendix. It is brief, and as follows: "On the 18th of June the regiment made a charge across a wide, open field and through a deep cut on the Suffolk Railroad suffering very severely from a galling cross fire. Then charged again from the railroad up to within 160 yards of the enemy's works, and threw up the rifle pits. Our loss on this day was about half the effective force engaged." The line in front of Fort Morton, where our brigade had fought on the evening of the 18th of June, was pushed up nearer to the rebel line than at any other point, being at one period only 125 yards from that line; and this advanced part of our line was commonly called by our men "the horseshoe." Directly in front of the "horseshoe" and opposite to Fort Morton, upon a swell of ground rising some thirty-five or forty feet above Taylor's Creek, was a Confederate fort, mounting four pieces of artillery, occupied by Pegram's battery, supported by two battalions of South Carolina infantry. This fort or battery formed a salient in the Confederate line, known as "Elliott's Salient," pushed forward beyond the general trend of their line, and we who had occupied the "horseshoe" during the month of July, were well aware that a tunnel or mine had been run from the bank of Taylor's Creek, inside our line, under this fort. General Burnside now determined to continue his success of the 17th by advancing his 1st and 3rd Divisions on the morning of the 18th, the 2nd Division, ours, to act in support. Accordingly, at day-dawn, the attacking columns moved forward, the 2nd in support of the 3rd Division. As the battle developed, the 48th (a part of the 1st Brigade) found itself in front of what was afterwards designated, "Elliott's Salient," with a deep railroad cut between them and the enemy, who were in position in front of the Salient and near the cut. Led by the gallant Curtin, we made a vigorous charge down to, and across the cut, through a ravine beyond, driving the rebels before us, almost into their works. The point gained was nearer the main line of the enemy than that secured by any other portion of the army. Finding their position too strong to assail successfully, the line halted and immediately commenced to fortify. The 48th continued to hold this position until after the successful explosion of their mine on July 30th. General Curtin having been seriously wounded in this charge, Colonel Henry Pleasants took command of the brigade, and Captain Joseph H. Hoskings that of the regiment. - The Story of the Forty Eighth pg 206. June 18. - At 5 a.m. the whole line made an advance for about a mile, the enemy having withdrawn from our immediate front during the night. At 12 m. we made another advance to the railroad, and at 3.30 p.m. attempted to storm the enemy's works, which was not accomplished. Remained here until midnight, when we were received by the second Division, Ninth Army Corps. - Hartranft report The War of the Rebellion Official Records pg 198. June 18, at 4.30 a.m. I was ordered to move forward again and attack. A party of skirmishers was sent out in advance to feel for the enemy, and reported that the latter had fallen back, and with skirmishers deployed I moved on, Hartranft's brigade in front, across the fields and into the woods, toward the Taylor house. In the woods we encountered the enemy's skirmishers and a brisk shelling from their batteries across the Norfolk railroad. We drove back their skirmishers steadily out of the woods and into the cut of the Norfolk railroad, which formed a deep cover. On coining to the edge of the open field near the Taylor house, we found that the enemy had built a strong line of intrenchments beyond the railway cut and a winding ravine, through which ran a small creek, whose banks immediately in my front, were steep and covered with wood and thicket. Here, then, were two lines of obstacles interposed between me and the enemy's works. Moreover, the advance to the railroad was over an open field exposed to fire. The enemy's line was about 800 yards from the Taylor house, running along the foot of Cemetery Hill, turning to our right toward the Hare house, and crossing the railway at a point where a gun in position swept the railroad cutting for some distance. I brought up Roemer's battery and put part of it in position to command this gun, and part to reply to a battery which fired from the left and front. General Crawford's division, Fifth Corps, had advanced through the woods in connection with me, and on my left, and Potter's (Second) division, Ninth Corps, now came up to support me. I ordered Hartranft to carry the railroad cut, which he did in good style. Crawford's troops did the same on our left. After this General Barlow's division, Second Corps, came up on my right, and I proposed to Crawford and Barlow to make a general attack on the works at 12. Crawford acceded, but Barlow replied that he had no orders to attack. I considered a vigorous attack on Barlow's front essential to my success, as I was exposed to a heavy enfilading fire from the works that there curved around my right. The enemy's sharpshooters were picking off my men in the cut every moment notwithstanding the traverses we threw up. At 3 p.m. a general attack was ordered by the major general commanding the army, and Hartranft began to move his command again, with Curtin's brigade of Potter's division, on his right, and Colonel Raulston, Twenty-fourth New York (dismounted) Cavalry (now commanding Christ's brigade), supporting. The railway bank was quite high and so steep that holes had to be dug in the side of it for the men to plant their feet, and as soon as a man showed his head he came under fire. This, of course, led to vexatious labor and delay in order to prepare the line to climb the bank simultaneously. On the extreme left, where the bank was lower, the movement began at once, and here the troops got as far as the ravine, driving out the enemy at the same time with the Fifth Corps troops. Every preparation being made, under a galling fire, at 5.30 the whole of the division and part of Curtin's brigade made a determined advance. The whole ground from the railroad to the ravine was carried, officers and men falling at every step. The ravine was crossed, the crest beyond gained, and under the fire of a heavy line of battle my heroic troops fought their way up to within 125 yards of the enemy's intrenchments and held their ground. There were not over 1,000 uninjured left in the ranks to intrench themselves when night came on. The Second Brigade changed its commander three times on the field. Colonel Raulston, Twenty fourth New York (dismounted) Cavalry, and Lieutenant Colonel Travers, Forty sixth New York, successively commanding this brigade, were shot down at their posts. - Willcox report. The War of the Rebellion Official Records pg 573. June 18, at daylight, it was found that the enemy had retired during the night and taken up a new line on the Cemetery Hill, beyond the Suffolk railroad. The brigade advanced in line of battle through a thick belt of pine timber and emerged into an open field of grain, sloping gradually toward the Suffolk railroad and the enemy's works. The Sixtieth Ohio was deployed as skirmishers, facing to the right to protect that flank. The remnant of the First Michigan Sharpshooters was engaged in the throwing up works for Roemer's battery near the edge of the above mentioned belt of timber. About one half of the Fiftieth Pennsylvania was also employed as flankers on the right. The remainder of the brigade charged in line for a quarter of a mile across the open field, suffering severely from a galling fire from a very long line of the enemy's rifle-pits. The railroad cut was reached, but it afforded no shelter, for it was enfiladed by a storm of bullets. The men attempted to climb out of this cut, but only to be mercilessly shot down and to fall back among their comrades. The loss at this point was severe. Toward evening another advance was made, which was pushed to within 150 yards of the enemy's line. Here the men constructed slight works for their protection, and before morning the brigade was relieved and moved to the rear. - Cutcheon report. The War of the Rebellion Official Records pg 585. [...]the morning of the 24th, when it was relieved by the troops of the 10th Army Corps, and moved back and took position in the trenches, a little to the left of the place occupied on the night of the 18th, with our right resting on the "Suffolk road" or "Baxter Road." On our left of this road, and directly in our front in the rebel line, was a two-gun battery, known to us then as the "Suffolk road battery," and by the Confederates known as "Davidson's battery." It was distant from the right of our regiment about 180 yards. Our picket line was advanced beyond a small water course called "Taylor's creek," and both the picket and the main lines were so close to the enemy's line as to be within almost point-blank range, and few days passed that some one in the Brigade was not killed or wounded. This life soon became monotonous, and the men were so accustomed to the danger that the exposed themselves recklessly. Several were killed while attempting to secure a small piece of ice from an ice-well, near the Suffolk road. - The Twentieth Michigan Historical Collections, Volume 30 pg 128. So we can see that the 9th Corps is claiming to have charged near the future site of the Crater on June 18th. The 48th Pennsylvania was a regiment of coal miners who would later dig the mine under Elliott's Salient, so we have to assume they had some idea where they were in relation to the future mine. The 9th Corps being at the future site of the Crater does not automatically mean all reports from the 5th Corps that mention the Crater are wrong. 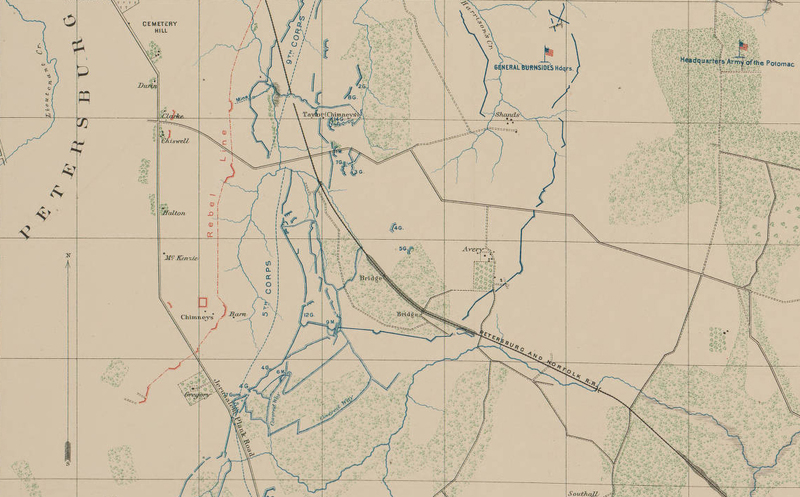 From these accounts it would be safe to assume that the 9th Corps was charging from a position north of Crawford towards Elliott's Salient, while Crawford was charging from the south by the Baxter Road. We can see from Willcox report that Crawford was on Willcox's left moving together with the 9th Corps, capturing the railroad cut before noon and reaching the stream by 3. The right of the 9th Corps having great difficulty getting out of the deep cut of the railroad to the stream beyond, finally takes the stream at 5:30 pm. On the morning of the 18th the Fifth Corps, on the extreme left, advanced and pushed the pickets of the enemy back over the Norfolk and Petersburg Railroad, and up the hill to the right and left of the Baxter Road, Crawford's (Third) Division on the right, making close connection with the left of the Ninth Corps. Two brigades were in line, the Third on the right, the Second on the left; the First was in reserve. We assaulted the enemy's lines and fought our battle exactly on the ground where the mine was afterwards exploded, that is, where Elliot's salient of the Confederate line was established. Our left reached the Baxter Road, and our right was well over to and beyond the site of this salient. - The Petersburg Mine pg 224. June 18, 1864 - 7:05 a.m.
General Crawford is leading on; the advance has gone through the woods to an open place. Enemy's skirmish line strong on a crest in his front. He prepares to push on. Ayres and Griffin advance in support to close a gap between Cutler and Crawford. - The War of the Rebellion Official Records pg 174. The enemy have developed a full line of battle, with plenty of men and guns. It is an intrenched line, and runs along the other side of the ravine in which the Norfolk and Petersburg Railroad enters town. The course of their line is about north and south. Our skirmishers have driven theirs over the railroad, both in Genreal Cutler's front and a small part of Crawford's. Cutler is putting in a battery to silence theirs. Their line is on a high crest, and apparently strong. Only two guns of the enemy have opened so far. Their men are standing on top of the breast-works. Major and Aide de Camp. June 18, 1864 - 8:15 a.m.
Am at the line taken by Burnside last night, beyond the house at our advanced breast-works. Crawford is the other side of the wood. Griffin is forming here. - The War of the Rebellion Official Records pg 175. General: My skirmishers have advanced until the enemy’s works are plainly visible. I am pushing my lines as close as possible to the enemy’s works. The sharpshooters that fired into these woods have been driven off. My line is still moving on. - The War of the Rebellion Official Records pg 186. General: I am now in the cut of the railroad. Beyond this is a deep ravine, and beyond a slope, on the crest of which is the line of works of the enemy. A creek runs along the ravine, and this, with the railroad and ravine, will break the lines as they move. Shall I go on alone? Colonel Sweitzer is across the railroad and advancing; General Crawford also advancing. The batteries have gone forward to shell the enemy’s ridge while our men advance. T. Lyman. - The War of the Rebellion Official Records pg 177. June 18, 1864 – 12:30 p.m. I have not received any written report from General Crawford, but a staff officer from him says that he captured about 60 prisoners and a battle-flag from Pickett’s division; that as far as he is able to learn we do not hold any part of the enemy’s works, and that it is impossible for him to intrench any part of his line, as it is under fire, and that he does not think it possible to make any advance from his position until the batteries on his left are silenced. This we have been unable to do all day, and they will probably be so well protected in the morning that it will be impossible. I agree with General Crawford upon the inpracticabililty of advancing where he is, the enemy’s main line not having yet been reached after all General Burnside’s efforts, nor do I see any chance of attacking to our left of that, except by attempting to turn the enemy’s extreme right along the railroad and Blackwater. I am not acquainted personally with the ground to the right of General Burnside and in front of General Hancock and General Smith. The last prisoners reported the continued arrival of re-enforcements. I have most of my corps in position to move to any part of our front, either by night or day, without observation of the enemy. - The War of the Rebellion Official Records pg 178. June 18, 1864 – 4:55 p.m.
Crawford continues pressing with quite sharp musketry. General Warren will try to push the assault over the works along the whole line, if there is any chance. - The War of the Rebellion Official Records pg 180. 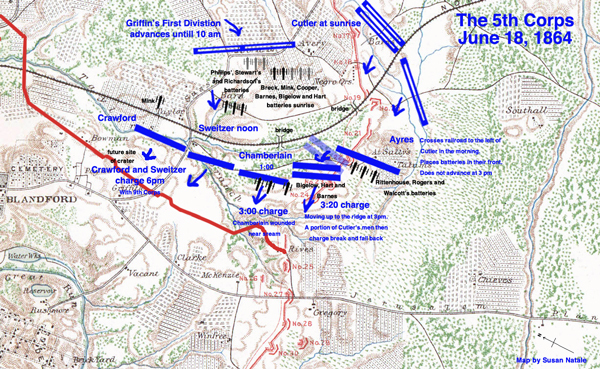 6pm Another assault; chiefly on the right by Sweitzer’s brigade, Crawford’s division and parts of the 9th Corps. Another attack made by my right failed to take the enemy’s line, but we advanced up quite close to the works, and hold all we got. We want to make another effort just at dark. - The War of the Rebellion Official Records pg 181. Your dispatch received. I have three brigades on other side of the railroad, and I think it quite desirable to hold the position, but if you withdraw I must also. Have you fully decided to withdraw? Please answer at once. - The War of the Rebellion Official Records pg 182. June 18, 1864 - 10 p.m.
General Warren has gone to bed. He has decided to withdraw from the advanced position held to-day. General Crawford will keep good his connection with your left. We soon advanced across an open field, our battery lining with us, one gun at a time, firing as fast as they could. We halted in that field and lay close for fifteen or twenty minutes, bullets and shells flying everywhere, Montgomery saying that they would hurt some one yet with their carelessness. We soon got orders to go for the railroad cut, and John Campbell and I were the first in, the cut being some fifteen or eighteen feet deep, a road bridge over it where we went in. When we were all there we got orders to double-quick to a little stream by a hill-side, a meadow with high grass intervening, the place being probably 200 yards from the railroad. Campbell and I had the advance, and when we got there we were amused to see the boys coming through the knee-high grass and thumbing in and over the concealed ditch some four or five feet wide. There was a steep hill thirty-five or forty feet high running north and south, and the stream was just at the foot of it. I climbed to the top and, looking across a cornfield (corn five or six inches high), saw that the reb skirmishers had carried piles of rails about a wagon-load in each place and about twenty yards apart, facing us, and beyond that about 175 yards was their main line, with a battery facing us. After quite a while an aide instructed our commander to keep his men well in hand for a general charge at six o'clock. Roll was called, and Ninesteel said that there were just sixty men with the colors. I heard the order coming down from the right to fall in, but I just climbed to the top of that hill and sat there looking back at the line forming. I made up my mind that we couldn't go into that line of works, but I was going to make the best time for a rail-pile, anyhow, and if the line came up I would go along with them. About the time Smith was hit, the two boys, Devine and Ewing, came along with the colors. All this had happened while the two boys were coming from where the line had started. They passed on just to our right. Campbell remarked, "Just look at those boys; they will lose the colors; I can't stand this; I'm going, too," and away he went, followed by Gilligan and myself. They had reached a worm-fence sixty-five or seventy yards from the fort containing the four-gun battery. The fence was in a depression just a little lower than the field, fifty yards back, and running parallel with the reb line, some rag-weed and poison-ivy growing along it. Their line was on higher ground, and we silenced their battery at once. They tried to load, but it was no use; we would fire at their hands and arms and put a veto on their work. One piece had a rammer in, which they tried several times to remove; but we were superintending that, and at dark it was there yet, but they removed it in the night. For a while they did some peeping over the works; but we, having the sky for a background, could see a bird at that distance, so we let go every time a head appeared, aiming to hit the slope a foot or so in front of the eyes, and the head would disappear awful quick. Night soon closed down, clear but no moon, and we supplied ourselves with ammunition and strengthened our line, the neighbors up the hill doing the same work; but the shooting was kept up all night, no one getting much rest. - History of the Eighty-Eighth Pennsylvania volunteers. pg 192 - 194. So what I gather from the sources is that Crawford who commanded the Third Division of the 5th Corps, on June 18, 1864 had his left on the Baxter Road and his right by the future site of the Crater. On his right was the 9th Corps and on his left Sweitzer, who commanded the Second Brigade of Griffin's First Division. Crawford's Second Brigade, that included the 88th Pa., is described as being on the left with the Third Brigade on the right and First in reserve, it therefore makes sense that the 88th would describe a road bridge over the railroad cut where they went in. Crawford's skirmishes are described as starting to drive the enemy out of the railroad cut around 7:30 am while Griffin's division was still in reserve in the woods behind them. Crawford made it to the railroad sometime before noon and kept pushing forward, he made a joint attack with Sweitzer and the 9th Corps at 6pm, got very close to the enemy's works but then retreated back keeping a connection to Sweitzer on his left and the 9th Corps on his right. Keep in mind the woods mentioned by the 9th Corps and Crawford is a different woods from the one we will see Sweitzer, Cutler and Chamberlain's men describe in a moment. What woods they mean will become clear as they describe their position in relation to it. See map below for the locations of the woods. (It has been suggested to me by Dennis Rasbach, coauthor of Joshua Lawrence Chamberlain and the Petersburg Campaign that my analysis is wrong due to the following proof, "The history of the 16th Maine Regiment, Crawford's division, corroborates the information concerning this advance alongside of the IX Corps, the taking of the railroad cut, and then a withdrawal to the east side of the railroad and the throwing up of entrenchments there on June 18: In the assault that was made, the brigade advanced nearly a mile, forcing back the rebels, and gaining position on the Norfolk Railroad, within a mile and a half of the city. Withdrew from railroad cut, and formed in line of battle in the county road, along the base of the slope overlooking and near the railroad. Here the men worked diligently all night, throwing up intrenchments. The 13th Massachusetts, unlike some of the other 3rd Division regiments, did not stop at the railroad cut. They sent advanced skirmishers off to their right flank where, protected by woods and ravine, they were able to ascend a gully on a hill extending from the creek bank to the upper line of Rebel earth works. Beginning on June 18, they deepened and extended the gully, so as to form a sunken way that could be safely traversed. 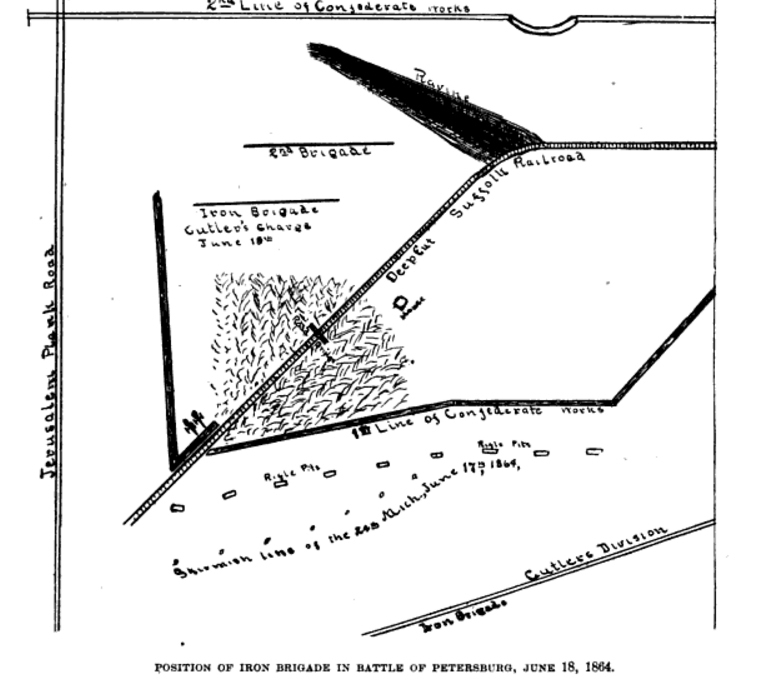 The men of the 13th Massachusetts named their hill Fort Crater. They were expecting to make a charge on the works to the front at 7:30 p.m., but the plan was abandoned. " The Twenty-second deployed skirmishers in front of the brigade, in an open field with woods on our left, our orders being to move at a double quick and occupy the ravine directly in front of the Norfolk Railroad. We swept forward at a run, in the face of heavy canister-fire, and that of the rebel skirmishers who were on the brow of the steep hill overlooking the ravine. The left of the Twenty-second, under Major Burt, reached and held the ravine, and drove the enemy from the brow of the hill, where we made our first halt. The right of the Twenty-second got into the ravine; but the rebels, after being driven, rushed over to a fence, where they soon poured in an enflading fire though this ravine, causing us to evacuate in haste, we ran up and into another ravine, which intersects the larger, and first one gained, nearly at right angles; but here we met shells and canister from a direct front. Too terrible for human endurance! ‘to the road!’ shouted Capt. Rock, who commanded the right wing of the regimental skirmish line. We started immediately by an oblique, the enemy pouring in a terribly destructive fire. Some reached the shelter of the road, but the right wing had to fall back, the left still holding on to the brow of the hill first gained, where we lay hugging the ground. Orders came, however, for the right to move forward again and hold the ravine It did so with a yell, pushing the rebels back again. The whole of the Twenty-second, with one hundred men of the Sixty-second Pennsylvania as skirmishers, the remainder acting as a skirmish reserve, all under command of Col. Tilton, then again moved forward out of the ravine, and with a steady but resistless rush swept into the Norfolk Railroad cut, driving the rebels into their breastworks, and occupying a position within one hundred yards of their intrenchments. [sic] Our line of battle followed up this movement, and at six P.M. a charge was ordered. - History of the 22nd Massachusetts Infantry pg 471 – 472. On the 18th of June, General Meade ordered a simultaneous attack on the enemy's works, and fixed the hour at twelve o'clock, directing all the corps to attack at the same hour with strong columns. General Burnside's and General Warren's Corps were kept occupied in endeavoring to drive the enemy out of the railroad cut in their front, so as to get close enough to the enemy's intrenchments [sic] to assault. The ground to be passed over was open and exposed to the enemy's artillery fire for a long distance. General Meade again ordered assaults by all the corps with their whole force at all hazards as soon as possible, as he found it useless to appoint an our to effect co-operation. - Under the Maltese Cross pg 294. At day-light on the morning of the 18th the division moved down the first line of rebel works, which had been captured the day before, and was placed in line of battle in rear of the Third Division, when the order to charge across, and capture the Suffolk and Petersburg Railroad was given. Advancing at a double quick the enemy was driven to his next line of works, and the railroad which had been previously captured and lost was regained and held. - 91st Pennsylvania Volunteers pg 192. By a strange misunderstanding, the line obliqued according to an order said to have been given, and the rebs poured in an enfilading fire from their works in the edge of the woods; the line broke, and fled in great disorder; the loss was very severe when the boys fell back. If they had kept straight forward, the works would have been carried, for when the disaster occurred, many parts of the rebel lines were falling back, their batteries limbering up, their caissons exploding, etc. All this in front of where our boys made a steady pull directly for the center, when other parts of the line broke. When the men obliqued, the rest caught the impetus rearward, and away they went. - Four Brothers in Blue pg 439. I deployed in an open field near Colonel Avery's house, with my right resting on the Norfolk Turnpike Road. We pushed forward to the Norfolk railroad, which crossed the pike and to a ravine beyond, where the right of my line, being more exposed than the left was driven back. The left, however, under Major Burt, held its own, having shelter in the rear of a crest. I thereupon strengthened my right with 100 men from the Sixty-second Pennsylvania; went in again, when I succeeded in driving the rebel skirmishers out of the ravine into one beyond. About 12m. Sweitzer's brigade moved towards and took position in this last ravine, all the regiments but one being on the right of the road. The First Brigade, Colonel Chamberlain, then advanced to the ravine and took position on the left of Colonel Sweitzer's brigade. This was done under a very heavy fire, and the brigade lost more than 200 men, including Colonel Chamberlain, who was wounded. Thus we remained right under the enemy's works until just before dark, when I was ordered to take command of the First Brigade. - Tilton report. The War of the Rebellion Official Records pg 455. ...the regiment was hotly engaged near the Norfolk and Petersburg Railroad, the possession of which was stoutly contested. General Griffin, who commanded the division, and whose faith in artillery was remarkably strong, executed the novel maneuver of advancing a battery in front of the line of skirmishers, and opening with grape and canister. The enemy was soon driven and the brigade advanced, possessed the road and erected strong works beyond. - 62nd Pa History of Pennsylvania Volunteers Vol 2. pg 460. 11 a.m. 18th formed line of battle with Thirty-second Massachusetts, Twenty first Pennsylvania Cavalry (dismounted), and One hundred and fifty-fifth Pennsylvania Volunteers, all placed under the command of Col. E. M. Gregory, Ninety-first Regiment Pennsylvania Veteran Volunteers; advanced upon the enemy, drove him across the Norfolk and Petersburg Railroad; remained on the north bank of the railroad a short time; advanced again, driving him into his intrenchments about a quarter of a mile from the railroad, and threw up breast-works. Was attacked at 11p.m. drove him back. Kept up the fire during the night; relieved by a portion of Crawford’s division. - Lentz Report. The War of the Rebellion Official Records pg 461. June 18, moved out this morning at 6 a.m.; was assigned my position about 8 a.m., 600 yards in front and some 300 to the right of headquarters. As I went in position the enemy's batteries were firing bout with very poor effect. I remained here about half and hour, when I was ordered to advance my battery. I moved forward 200 yards, and to my right about 100, moving only one gun at a time. During this time and before this we had failed to injure the enemy's battery to any extent, as far as we knew. After firing a few rounds from this last position, I was ordered up still farther, and as the fire was at that time it was impossible to move my guns with horses, so I would fire my guns and then run them up a little more than the recoil, and in that manner I got my position, where we remained during the day. - Richardson report. The War of the Rebellion Official Records pg 486. These documents sugest that Sweitzer was right of a forest struggling to get across the railroad at noon. At one time they fell back running into a forked stream. 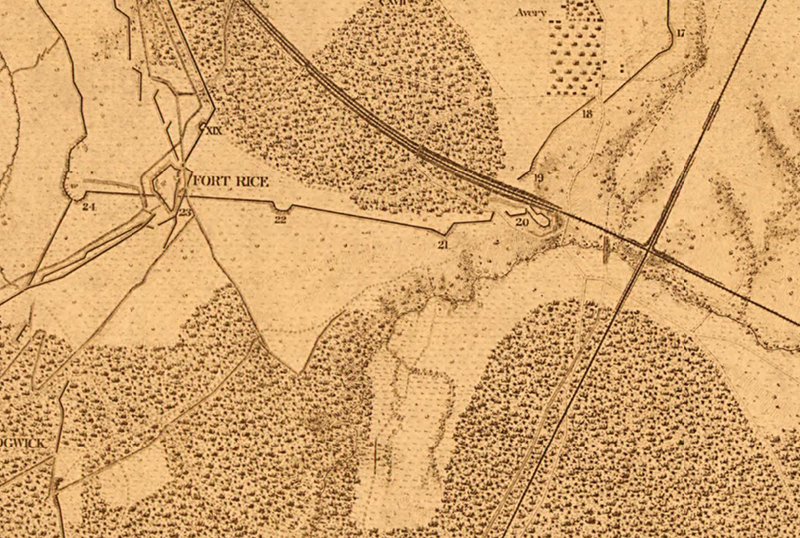 Some accounts suggest that the stream was east of the railroad (as seen on the map above-left), paralleling the Baxter road to the south, as they describe falling back and then retaking a stream before they got to the railroad cut. 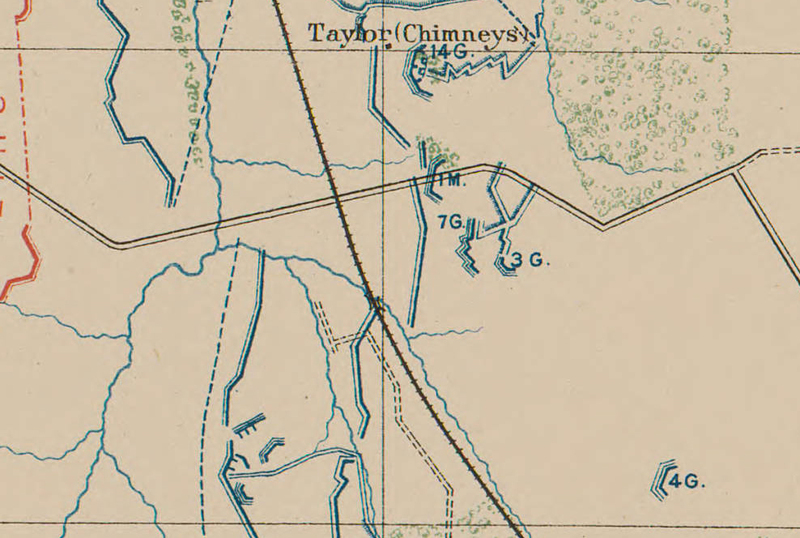 Tilton's report would seem to suggest that the stream was the fork beyond the railroad cut, as illustrated on the map above-right. Or possibly appearing as it does in the OR map at the top of the page, where only the fork of the stream goes east of the railroad. Both options could allow for their right to rest on the Norfolk Turnpike Road (Baxter Road) as they started their attack as Tilton describes. Two other roads ran parallel to the railroad, one in front and one behind, so when they say they ran into the road for cover they could be referring to either one or possibly the Baxter road or railroad. Finally crossing the railroad cut they ended up by the stream beyond it and erected a strong works beyond a road, as the 62nd Pa. tells. Tilton relating that all but one regiment was on the right of a road. What road they mean here is confusing. Do they mean they swung right and crossed the Baxter road? Or do they mean the small road in front of the Railroad? Or perhaps by road could they be referring to the railroad? It would make more sense to say that they were "beyond" the road in front of the railroad or "beyond" the railroad, "beyond" the Baxter road does not make sense. A line of works can be seen crossing the road in front of the railroad and also crossing the railroad on the map on the left. Could this be the line of works referred to when they say, "possessed the road and erected strong works beyond"? Crawford or the 9th Corps do not suggest in their accounts that Sweitzer got in front of them, so it seems less likely that Tilton was referring to the Baxter road. Some maps show the road in front of the railroad ending, some show it connecting to the Baxter road to the west of all the streams, and some show it connecting between two streams. Its hard to be certain what position Sweitzer would have been in to be right and left of it. 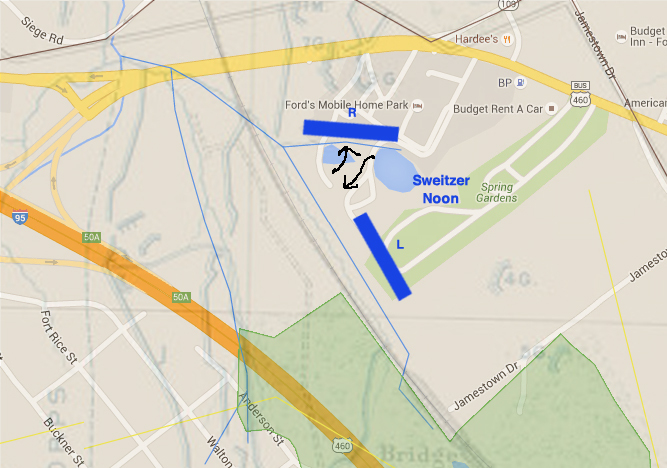 The position that the 118th Pennsylvania marks down on a map is curious, as they came to the support of Sweitzer's Second Brigade on the evening of June 18th, remaining there until they were moved to Fort Sedgewick on the 21st. Could they be indicating on this map the location of Sweitzer's brigade? What we are sure of is that Sweitzer made it across the railroad around noon from a starting point where the Baxter road was on his right and the woods on his left. Chamberlain meanwhile, seeing the hazards of the railroad cut, decided to not move in next to them but to loop around in the woods, this allowed him to sneak up on the guns that had been causing Sweitzer so much trouble. Sweitzer would later try again to move forward at 6pm. Most of Sweitzer's brigade seem unaware that Chamberlain charged at 3pm, here in Tilton's report he seems to suggest Chamberlain was wounded at 1pm, other accounts by this brigade would suggest that they believed Chamberlain to be wounded at 6pm. 3:30pm. The batteries all open from our side. ‘Now.’ Cried Griffin to an artillery officer ‘Captain’ I want you just to distribute your water –pots over that side hill! -We rode into and open plain to see the troops go up. 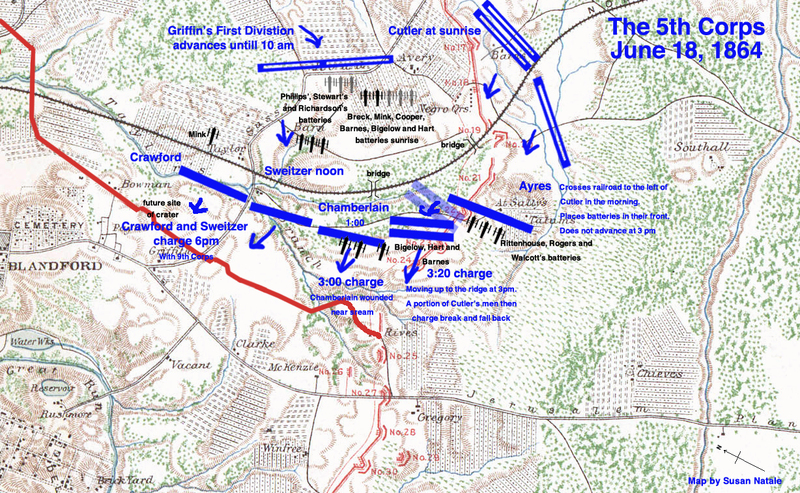 The advance was chiefly by the brigades of Chamberlain and – was on the left. It was as I expected – 45 days of death, danger, and toil are no preparation for a rush! The men moved up without spirit, received a withering fire, and fell back behind the first crest. Chamberlain desperately wounded. The railroad cut, which offered protection was filled with our wounded. June 18, 1864 - 4 p.m. The assault has been made, so far as I can see. Our left advanced under heavy fire and entered a small ravine close to their works, but could not get farther. The line there remains more or less covered. The center of my line (the only part I could see) got well under way at 3:15 p.m. It received a very heavy fire, and after carrying one ridge had to halt there. I received no report from any part of the line. I will try and strengthen the line up in the new position and advance again as soon as I do. We met a heavy fire, and have suffered considerably from it. The railroad cut is a great obstacle. This was the eighteenth of June, 1864. By one o'clock we had driven the enemy about one mile in a fair, open-field engagement, and had forced them back into their last line of works around Petersburgh [sic]. Durring the afternoon the 142d crowned herself with glory, in one particular move, which is deserving of especial mention. We were advancing and our position was in the center, if I recollect right, of the second line of battle, the lines being about ten rods apart. The enemy was pushed out of a woods into an open field, our front line marching forward and firing, and the enemy returning the fire, but falling back. General Chamberlain, commanding our brigade, noticing that his front line was shorter than the enemy's - about a regiment - dispatched an aid with orders to me to double-quick the 142d and form them on the right of the front line. I gave the command to the regiment and we moved double-quick, leaving the line we were in, and when we were sufficiently away from them, moved by the right flank and then by the left and formed, joining the right of the front line, and our men opened fire and moved right along, firing with the front like, until we had driven the enemy, as I said before, into their last line of works. This movement was made just as coolly and almost with as much precision as it would have been done in drill, and our regiment was highly commended for its beautiful performance. At this point there was a hill over which the enemy had gone, and through a ravine, and on top of the opposite bank of this ravine, about fifty feet back, was situated their last line of works. - Two Reunions of the 142nd Regiment, Pa. Vols. pg 34. About 10:30 a.m. the Regiment, with its Brigade, moved by the left East, and thence South across the Petersburg and Norfolk railroad, on a bridge muffled with grass. Turning West it moved steadily, but surely, upon the right flank of the rebel forces under a hot and galling fire of shot and shell from the rebel guns. The rebels held the railroad, and a large hill just south of it. Now, as Warren's men were firmly advancing on the flank, Hancock pressed the rebel front, and about 12 m. a simultaneous attack was made through a storm of fire, and death and blood, and carnage, and the Rebel line, torn and bleeding was forced into the inner lines ear the city. - History of the 187th Regiment Pa. Vol. pg 94. - History of the 187th Regiment Pa. Vol. pg 96. In a few moments after this, you moved us to the left along and across the Norfolk railroad, which I think was the name of the railroad, and into a woods where the enemy soon found the range, and you were dismounted by a shell killing your horse and also killing three men and wounding seven others. [...] Now, going back to the time your horse was killed. You moved us to the right, out of these woods, half wheeling the regiment first to the right, then to the left and forward so that the ridge in our immediate front protected us considerably from the artillery firing of the enemy until you had the front of the brigade well on to the top of this high ridge where an old rail fence ran along, with considerable brush and briars which obscured our line to some extent from the enemy, and we laid down waiting for the order to charge. [...] The 143d regiment P.V. held your right on front line, and I commanded the right company. When we halted and laid down we were on the side of the ridge sloping to the rear. This ridge ran nearly parallel with the enemy's main line, and within four or five hundred yards of their main works. [...] A few minutes after this, the aide returned and the movement forward was commenced. After crossing the old fence, the ground sloped towards the enemy. We had to move down this slope through an old field partially covered with shaking asp, brush and briars. First, quick march; soon after, double quick and finally we went on the run with our brigade commander, yourself, in front carrying the brigade flag, rushing on until we reached the bottom of this slope which was filled with brush and running sweet briars, alder trees, and part of the ground was composed of marsh, swamp and deep mud. On the other side a small rivulet or stream ran down right along our front and washed out three to five feet deep and from four to six feet in width at the top with banks perpendicular. From this point the ground gradually ascended to the point or ridge on which the Confederate line of breastworks and fortifications were erected with numerous lines of rifle pits covering every approach. [...] the boys rushed on in the wake of their commander amidst this terrible hail or iron and lead until nearing the bottom of the slope, heretofore mentioned, where you directed the line to oblique to the left. The swamp and brush was hard to get through, as it was forty or fifty yards across at many places, - it really was an obstacle line the sunken road at Waterloo, that you did not observe until we were mixed in it and then we had the deep gully made by that small stream to cross. Many of the boys jumped across it and fell back into the mud and water and clambered up its steep sides and rushed on up into the field and nearly reached the enemy's breastworks when the troops off to our left broke back. I heard it was Cuter's Division, but as to that I am not clear. However, I saw troops go back, a great mass of them, which permitted the rebel line to our left to turn all their attention to your brigade. Inasmuch as the rebel line of works ran down so that we seemed to charge into a crescent shaped position strongly intrenched, after we left the stream in our rear and pushed on up the hill towards the rebel works, we stopped the fire of several of their guns, our whole line was enfiladed heavily from the left and right by rebel fire. If the brigade had been well supported, we would have cleared the works of the enemy. I am not clear as to the spot where you fell and received your terrible wound; it has always been my impression that it was near the gulch washed out by that small stream on the top of the bank. - Patrick DeLacy's Petersburg Account pg 3 - 7. You will recollect we followed Gen. Chamberlain's charge on the gallop up the hill. We stopped at the crest, about on a line, and 300 yards from the enemy's works; we fired across an intervening depression. As Gen. Chamberlain charged across this in order to reach their line of works opposite us, they received a raking fire from a masked battery in a clump of trees. Some of them became demoralized and fell back; many came in through our battery. I tried to find out from the stragglers whether any infantry remained in our front to protect us against a counter charge, as the railroad cut in our rear prevented our getting away. They were too frightened to reply. I called Lieut. Milton, and together we stopped over 100, made them lay down and load up; with these we held our position till dark. While engaged in stopping the infantry, word was brought to me that Gen. Chamberlain lay in our front, badly wounded. I sent word to the ambulance to take the stretcher and bring him in, my informant acting as guide. When they reached the General, he told the men to let him go, he was too severely wounded to live, and to take some of the others about him more fortunate. Our men replied (he told me), "We cannot do that, sir; Capt. Bigelow's order to us was to bring you back, and that is what we must do." This scene was enacted under a heavy musketry fire, and a life of great subsequent usefulness saved. - History of the 9th Massachusetts Battery pg 121 - 124. On my return to Petersburg, I found myself among friends. The old Confederate officers in the city were gathered in force to greet my coming. And strong, manly men they were. Nothing could exceed their heartiness and hospitality. They opened for the occasion their hall of war records and relics, where we talked over the feats and defeats of many an old field. In the evening there was a symposium, where our various experiences and different views of things gave spice to comradeship. Perhaps the most striking attention received was that of an old Confederate from the ranks, who was at Rives' Salient on that dark June day of the bloody years, and who was as badly cut up with wounds as any man I ever saw alive. Our interview was both sharpened and deepened by our reciprocal experiences on that mortal day. - Reminiscences of Petersburg and Appomattox pg 171 -177. We followed a rough track up to the woods, and there formed in two lines, with two regiments as a flanking force to support me on the left. I then instructed all the field officers what my plans were. We were to advance noiselessly as possible through the woods, and emerging, fire there a volley & make a rush upon the flank of the rebel guns, and overwhelm them if possible before they could recover their wits. The second line was to follow the first at a distance of 100 yards, till their line came to join with the first or replace it. It was a situation where the commander should lead; for quick action and change of action would be required. So with the whole staff, flag flying aloft, and the splendid lines close pressing, we mand for the guns. Then a burst of artillery fire turned upon us with terrible effect. Down went my horse under me, a piece of case shot going through him; down went every one of my staff, wounded or unhorsed; down went my red Maltese cross, flag of our brigade, but on went everybody, on for the guns. Enfilading fire from great guns on our left, tore the earth before us, behind us, around us, through us; the batteries swung and gave us canister, & before we could reach them, limbered up and got off down the slope under cover of their main entrenchments. We only got their ground, and drove away the guns. I was mortified, greatly troubled. But the enfilading fire was so heavy we had to get a little below the crest we had carried, and prepare to hold it against attempts to recover it. - The Charge at Fort Hell pg 5. I have just received a verbal order not through the usual channels, but by a staff-officer unknown to me, purporting to come from the General commanding the army, directing me to assault the main works of the enemy in my front. Circumstances lead me to believe the General cannot be perfectly aware of my situation, which has greatly changed within the last hour. I have just carried a crest, an advanced post occupied by the enemy's artillery supported by infantry. I am advanced a mile beyond our own lines, and in an isolated position. On my right a deep rail-road cut; my left flank in the air, with no support what-ever. In front of me at close range is a strongly entrenched line of infantry and artillery, with projecting salients right and left, such that my advance would be swept by a cross-fire, while a large fort on my left enfilades my entire advance, (as I experienced in carrying this position.) In the hollow along my front, close up to the enemy's works, appears to be bad ground, swampy boggy where my men would be held at a great disadvantage under a destructive fire. I have got up three batteries and am placing them on the reverse slope of the crest, to enable me to hold against expected attack. To leave these guns behind me unsupported, their retreat cut off by the railroad cut, would expose them to loss in case of our repulse. Fully aware of the responsibility I take, I beg to be assured that the order to attack with my single Brigade is with the General's full understanding. I have here a veteran Brigade of six regiments and my responsibility for these men warrants me in wishing assurance that no mistake in communicating orders compels me to sacrifice them. From what I can see of the enemy's lines, it is my opinion that if an assault is to be made, it should be by nothing less that the whole army. - The Hero of Gettysburg pg 8. The men in Chamberlain's brigade recall an initial advance sometime after noon where they moved left across an opening and gaining a woods, then south across the railroad then west, pushing the enemy out of a woods. They then lay behind a knoll until 3:00. The fence DeLacy recalls, is possibly the same fence Sweitzer's men describe the Confederates firing from. The batteries limbering up that Chamberlain describes, may be the same ones Sweitzer's men, in "Four Brothers in Blue," recall firing from the edge of the woods then limbering up. We see George Meade's aide-de-camp Theodore Lyman report that Chamberlain and someone else (who we will presume was part of Cutler's men) charged around 3:30 and entered a small ravine close to the enemies works. In this charge, Lyman states, Chamberlain was wounded. Chamberlain's men describe coming to a stream 50 feet infront of the last line of works, infront of this stream they were so close to the enemy that the guns could not be depressed down enough to do them any harm. The infantry could reach them though, causing them to roll down into the stream. John Bigelow recalls placing his guns 300 yards from the enemy's works with a railroad cut in his rear, to reach this position Bigelow crossed a bridge and a ravine. While the exact spot of Chamberlain's wounding is unclear, we know for sure that he came through the woods and we also know that he stuck the stream at a point where it ran extremely close to the enemy's last line of works. This would place Chamberlain between the north end of Van Dorn Street and south of Interstate 95. The best place to view the possible locations would probably be along Buckner Street, or looking down from the Confederate line on South Westchester Drive. Very gallant was the charge of Griffin's division close by the house of Mr Avery, near which General Warren established his headquarters. I climbed to the roof of the building, through which Confederate shells had crashed, "Do not let them see you use your glass," was the injunction of General Warren, who was sitting on the step of the portico. At my feet were the Union soldiers reclining on the ground; eastward, screened from the Confederates by woods, were the wagons of the Fifth Corps; westward, across the storm swept-plain, were the Confederate intrenchments, bristling with cannon and battle-flags waving above them; beyond were the spires of the city and the winding Appomattox. The Union troops did not retreat, but held the ground already won, went to work with shovels, and when once more the daylight appeared in the east, they were behind a line of works which they would hold from that hour to the close of the mighty struggle, ten months later, when the Confederacy would disappear like a bubble in a swirling stream. - Redeeming the Republic pg 333. At median on the 17th, together with battery b, first Pennsylvania Artillery, engaged rebel batteries nos 18 and 19, expending 200 rounds of ammunition with satisfactory practice. 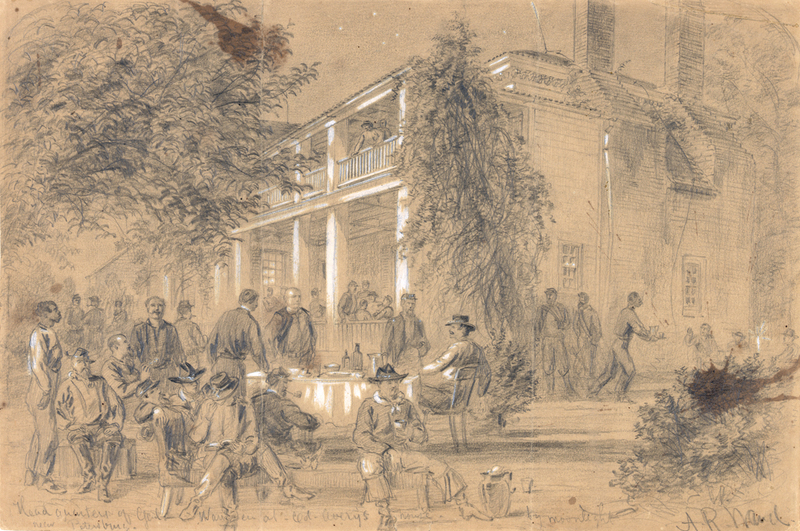 at daylight of the 18th advanced with Brigadier General Cutler's division (fourth), Fifth Army Corps, passing the rebel Colonel Avery's house, and entering the open field and the city of Petersburg. - Anderson's report. The War of the Rebellion Official Records pg 490. At daylight on the 17th I sent the one hundred and forty seventh New York to picket the Blackwater, and moved my command forward and went into position on the left of the Ninth Corps, my left extending toward the Blackwater and intrenched within about 600 yards of the enemy's works. At daylight on the 18th I was ordered to move on the enemy's works. The order was immediately executed. The enemy's first and second lines were found to have been abandoned during the night. A few men who were left asleep only were found. I pushed my skirmishers and line of battle forward across the Norfolk railroad and found the enemy on the crest beyond and in front of Petersburg. The enemy had set fire to the bridges across the railroad cut as they retired I immediately rebuilt the bridge in my front to enable the batteries to come up. Having formed my command on the left of the railroad in two lines I moved forward my right resting on the road and drove in the enemy's pickets on his works in front of the town General Ayres Second division having in the mean time come in on my left. At 2.50 p.m. an order was received to advance on the enemy's works; at 3 o'clock an order saying the moment was general. I immediately put my command in position to advance and 3:20 moved forward, my Second Brigade (Colonel Hofmann) leading, supported by my First Brigade (Colonel Bragg). General Ayres, of the Second Division, did not receive the order in time to enable him to move simultaneously with me. - Cutler's report. The War of the Rebellion Official Records pg 473. At 7 p.m. on the 17th moved about two miles to the front; found the enemy posted in rear of a strong line of works on the west side of the Blackwater road, our left joining the right of the First Brigade, whose left rested near the Petersburg and Norfolk Railroad; remained in this position all day. Loss, 10 men wounded. At 4 a.m. on the morning of the 18th the brigade moved forward to attack the works of the enemy. It was soon ascertained that the enemy had withdrawn during the night, and that he had also abandoned his second line of works about a quarter of a mile in rear of the first line. Upon moving forward the skirmish line the enemy was found posted in rear of a third line of works, his skirmishers thrown forward to near the railroad. The brigade was moved to the west side of the railroad, and formed in line of battle in a wood the right of the brigade resting on the railroad, and subsequently moved to the front of the woods and in rear of a hill. At 3 p.m. the brigade was formed in line of battle on the crest of a hill, and moved forward to charge the works of the enemy, then about 700 yards in our front. In order to reach the enemy's works it was necessary to cross a ravine about 200 yards in front of the works. The line moved forward with spirit. - Hoffmann's report. The War of the Rebellion Official Records pg 476. Map illustrating the Iron Brigade's position in relation to the abandoned Confederate line of works. Top map is the orignial from History of the Twenty-forth Michigan of the Iron Brigade pg 261 , bottom map is my placement of the positions on the first map onto a more accurate map of the day. Note that Cutler's line is not farther north than the Avery house seen on both maps. First map is orientated so north is to the right, second map north is to the top. The position of the Jerusalem plank road on the first map is incorrect. At sunrise on Saturday morning, June 18, the Iron Brigade was formed in line of battle on the extreme left of the Army of the Potomac. The Seventh Wisconsin was on the right, the Sixth Wisconsin on the left, and the Twenty-fourth Michigan, Seventh and Nineteenth Indiana in the center. They advanced across the Norfolk Railroad through three lines of Confederate works and forced the enemy's skirmishers to their earthworks, a mile from Petersburg, when the skirmishers were called in as the other Corps were not all moving forward simultaneously. The Iron Brigade with the Fifth Corps made a halt until the general assault of mid-afternoon, when all the Corps advanced. The Fifth Corps had over a mile to advance, and a deep ravine and intricate cut of the Norfolk Railroad interposed between it and the enemy's lines. This cut was deep and difficult to cross and was held by the enemy at its northern end. Its direction curved so as to hinder the advance of a line of battle. To the Fifth Corps was assigned the duty of clearing out the enemy from this cut, as a preliminary to the general attack. Its ground being thus difficult and chiefly in open field, was exposed to the enemy's artillery for a long distance. 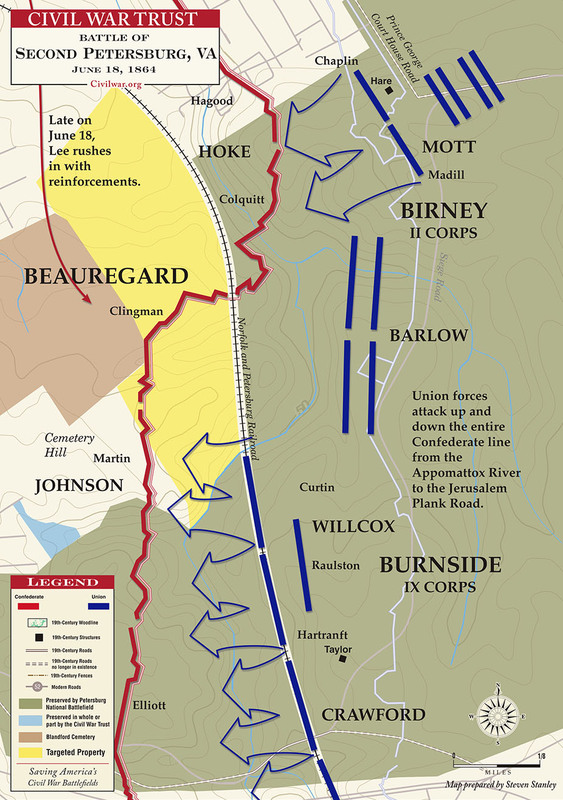 (See map on preceding page) Cutler's Division was formed for the charge in column by Brigades - the Iron Brigade in the second line. The formation of the column was made under cover of the woods and behind a slight hill midway between the woods and the enemy's works 500 yards away, over the fields without any protection from the enemy's fire, after exposing themselves on the hill. The order to advance was given and the men moved forward to the work assigned them, with a dash that would have been a victory, had not the order been given when the Brigade was under as deadly and withering a fire of artillery and musketry as it ever encountered, to move by the right flank so as to bring them directly in rear of the first line, as General Cutler thought it would make the charging column stronger. When the order to advance again was given, but a part of the Brigade obeyed the command - the balance falling back under cover of the hill. What few did obey advanced to a position within pistol shot of the enemy. Some of the men of the Twenty-fourth fell close up under the Confederate works. The men of the Division, finding themselves unable to carry the enemy's position, sought shelter in a ravine but a short distance from the works they had tried to carry, where most of them remained until after dark when they were all withdrawn and reformed under cover of the hill they had charged over during the afternoon. Shortly afterwards, the Iron Brigade was sent down into the ravine to try to carry the enemy's works from that point, but General Bragg deciding that it was impossible to do so, withdrew the Brigade to its position on the hill where the Division soon had a good line of works completed not three hundred yards from the enemy. History of the Twenty-forth Michigan of the Iron Brigade pg 261- 263. June 18, early our brigade formed line parallel to the railroad; moved forward, brigade front, past Colonel Avery’s house, through woods, and across the railroad; were moved back by the flank and about again, forming new line in woods south of the road. Forward again, left swinging round until we occupied line along the edge of the woods at angle 75 degrees to railroad; then up to the crest of a hill in open field some 500 yards from the rebel works. Fixed bayonets and at 3:30 p.m. steadily forward, the First Brigade supporting, subject to direct and enfilading fire of musketry and artillery till half the distance was passed, when we wavered, broke, and fell back, but preserving our organization. The regiment was reformed on the crest from where we started, and after moved to the right a short distance behind earth works. - Baily's report. The War of the Rebellion Official Records pg 477. As Cutler advanced it was discovered that the railroad ran through a deep cut turning sharply to the right, and that our whole line would have to cross it. A bridge across the cut was still in flames. On the right of Cutler's line the enemy's skirmishers were encountered on the opposite bank of the cut. A delay of some time was occasioned here before Cutler's line was reformed on the other side of the cut and the enemy's skirmishers had been pressed back. Griffin's and Crawford's skirmishers had now advanced over the open fields on each side of the Norfolk pike up the railroad cut the bridge over which was gone; the cut here was very deep, and after the men were got into it, it was hard to get them out again. Ayres Div in the meantime moved around behind Cutler to his left, along the old line of fortifications, and there formed, about half his troops being to the left of the old line as soon as his troops showed themselves, the enemy's guns opened upon them, doing considerable execution. The enemy's lines seemed to form a salient opposite Ayres where their new line joined on the old one; from this point a heavy sharpshooting fire was kept up on Cutler's right. [...] The simultaneous attack had been ordered by Gen. Meade for 12 m. to be made at all hazards, no matter whether we understood the ground or not, or were prepared any how. The attack was not made at the time as these was not even a line formed then. About 1 o'clock we were ready for an assault, and Gen. Warren suggested to Gen. Meade that perhaps 3 o'clock would suit to make a simultaneous attack. A general attack was ordered at that time. I carried the order to Cutler and in 10 minutes his men were ready, and the advance was made; the assault was made at about the same time along the whole of the 5th Corps front. The result was a repulse with a loss of say 1600 men killed and wounded; the nearest approach to carrying the enemy's line was in Griffin's front; some of the men were shot there within 20 feet of the enemy's line; Cutler carried a slight crest between his positon and the enemy's which he held; about 500 of his men went beyond this into a large ravine,the main branch of the Poo running directly in front of the enemy's line; these men were at first given up for lost, but the majority returned after nightfall. - Washington Roebling Dec 1864 Report. June 18, 1864 – 1:30 p.m.
- The War of the Rebellion Official Records pg 187. You will move on the enemy’s works at 3 o’clock. General Ayres will move on your left. This movement is general along the whole line. The men of ours who were in advance, were the 1st and 2d Brigades of the 1st Division, and Colonel Joshua L. Chamberlain, then in command of the 1st Brigade, fell, desperately wounded, and was promoted by General Grant on the field. General Grant in his reference to this in his Memoirs, says :- ‘He had several times been recommended for a brigadier-generalcy for gallant and meritorious conduct. On this occasion, however, I promoted him on the spot, and forwarded a copy of my order to the War Department asking that my act might be confirmed and Chamberlain’s name sent to the Senate for confirmation without delay.’ General Cutler with the 4th Division of the Fifth Corps secured a redoubt which the enemy had abandoned, and brought his left up into line with the other corps. - History of the Fifth Massachusetts Battery pg 871. Bigelow's and Hart's batteries were taken across the railroad and halted behind the crest with Chamberlain's brigade, First Division, while slight lunettes were being thrown up on the crest held by our skirmish line. At 3. p.m., when the general attack was made, these batteries were shoved up on the crest and opened on the enemy's works as our troops passed down into the intervening ravine. Barnes' battery was soon after brought over and posted about seventy-five yards to the left of the others. The attack failing, the batteries covered the withdrawal of our troops. - Wainwright's report. The War of the Rebellion Official Records pg 482. We were under orders to be ready for a general attack along the whole line, but no hour was given. I intended to run these two batteries forward as the infantry advanced, and as soon as they crossed the ridge, some fifty yards wide only on top, they would descend again. I should be able to fire over them with safety until they were close to the rebel lines. Having arranged matters here, I rode along the edge of the wood to the left to see the ground there. While talking to General Cutler, word came that the attack would be made at three o'clock; it then wanted but a few minutes of it; only just enough time to get the men up and in rank. At the same time too, I met Major Fitzhugh, who had come over to report, and see whether more batteries could not be used. He proposed to bring Barnes over to the left of Bigelow, to which I consented, as I was anxious to see that battery in a warm place, which it had never been before. At three the attack was made, Hart and Bigelow shoving their guns up by hand directly behind the troops, and opening immediately. The fire along the whole line was tremendous on both sides. the batteries being in many instances within long canister range of each other. I can not say that our men went in well, or at all as if they meant to carry the works. In five minutes they were coming back. Old Hart said the enemy were following them up, which at the time I also believed to be the case, and ordered them to keep on firing even through our own runaways. Finding several hundred men of the Forth Division who had come back behind the ridge on which the batteries were, I rode down there, and tried to get them forward again, appealing to them for the honour of the old First Corps. I thought I had succeeded, as I got them into some sort of line, but there was no officer with them higher than a first lieutenant, and they were from two or three brigades. One young adjutant who had been most busy in getting them formed now came to me and said the men would go if they had some officer of rank to lead them. Very foolishly, as I now think, for I knew nothing of the real state of affairs in front, I cried out that I would lead them myself; and in the excitement of the moment I should have done it on horseback, I believe, had the men gone, but not over some two dozen would budge. Had they gone I should probably have made no more entries here. In some fifteen or twenty minutes the whole attack had proved a failure, though it was some time longer before all our men got back out of the valley; and a great deal of firing was kept up all the afternoon, though nothing more was attempted on either side. - Diary of Battle pg 424 - 425. So we can see that Chamberlain was along the same edge of woods as Cutler, and engaged in the same 3:00 attack. General: I have established my line to the left of General Cutler, across the railroad, on a crest in the open. I drove the enemy’s skirmishers from it, and am now intrenching. Also shall establish batteries. The ground falls from the crest about 200 yards to a deep ravine. It rises from the other side gradually, about the same distance, to the first line of rebel works, still rising, you come to their second line. Their line runs beyond my left, which I have refused. - The War of the Rebellion Official Records pg 183. June 18, 1864 12 m.
General Meade has ordered an assault along the lines at this hour. If we carry the enemy's intrenchments, so that you can swing in with your right, do so, but I want our left as a pivot for the present. Knowing as you now do that there is a general assault, use your judgement in advancing if you see the enemy falling back, and look out they don't re-enforce their left from your front. June 18, 1864 – 12.20 p.m.
General: The enemy are reported by my skirmish line as going around our left double-quick. I think it may be that they think we are massing against their right. The cavalry is pushing out. Should the rebels turn my left with a strong force I can swing back into a strong line of works running at right angles to my present line. June 18, at daylight joined General Cutler’s division, and formed portion of his advance in the line to the Norfolk and Petersburg Railroad; 10 a.m. rejoined division and went in column in woods; 3 p.m. received orders from Colonel Dushane to prolong the left of First Brigade, which was changing position to the right; in doing so got under a most terrific fire of artillery and musketry; 5 p.m. ordered to the breast-works thrown up in the morning by the Sixth New York Heavy Artillery in the rear of battery on the left of line of enemy’s captured works; remained here till noon 22nd instant. - 4th Maryland. The War of the Rebellion Official Records pg 470. Saturday afternoon our whole division received orders to advance and occupy a line some three hundred yards in advance of that occupied during the day; so at four o'clock our line was formed and the order given to advance. My brigade was formed in two lines, and at the command, jumped over the breastworks and pushed ahead in beautiful order; but having to cross a cornfield in very short range of the enemy's works, they opened on us such a fearful fire of artillery and musketry that I lost one hundred and fifty-nine men killed and wounded before I gained the desired positon. Once there, we held on, and very soon threw up a little work along our line which covered my men very nicely. It is truly wonderful, the quickness with which our soldiers can throw up sufficient earth to protect them from rifle balls. Bayonets, spoons, hands, sticks, - almost anything is used to "scratch dirt," and like magic a line of two or three thousand men who are one moment exposed to every shot will be pitching head foremost into the earth, like moles. The brigde of regulars on my left, lost even more heavily than I. Meanwhile Ayres’ division, with Rittenhouse’s, Rodgers’, and Walcott’s batteries, had passed around to the left of Cutler and crossed the railroad. The three batteries went into position 900 yards in front of the great salient of the enemy’s works and opened fire. [...] The position held by Mink’s, Bigelow’s, and Heart's batteries was within easy canister and musketry range of the enemy’s works and all suffered severely. - Wainwright report. The War of the Rebellion Official Records pg 482. It would be safe to assume that artillerists are a good judge of distance. So lets look at Wainwright's report for where the batteries with Ayres were placed. 900 yards would either be in the woods, or somewhere around battery 22. Ayres states that if his left was attacked he could "swing back into a strong line of works running at right angles to my present line." The 4th Maryland with the Second Brigade mentions moving at 5pm to a breastworks thrown up by the Sixth New York Heavy Artillery in the rear of a battery left of the line of captured works. The Sixth New York Heavy Artillery recalls leaving their old breastworks to build a new one three hundred yards forward at 4pm. They moved forward with their brigade (the Third Brigade) with the First Brigade on their left. Either the Sixth New York stayed on the left of the enemy's abandoned works or they crossed over and took the position Cutler had left. The fact that they recall crossing a cornfield sugests that they stayed to the left of the abandoned works and crossed Tatum's farm (see OR map top of page). They would end up 600 yards from the enemy's works at 4pm. Wainwright states that Mink’s, Bigelow’s, and Hart's batteries were within musketry range of the enemy. He does not list Ayres batteries, Rittenhouse’s, Rodgers’, and Walcott’s as being within this range. Musket maximum firing range is about 600 yards. Effective firing range 100 to 400 yards. These facts suggest that Ayres was left of the enemy's old line of works and back and to the left of the place where Chamberlain would place Bigelow and Hart. At 9pm after the battle had ended, Ayres not taking part, he would change his position, moving inside the old Confederate works for the night. Accounts from both Chamberlain and Cutler's men suggest that they both moved to the right after a 3pm charge. Most likely to shorten the gap between Chamberlain and Sweitzer. June 18, 1864 – 9 p.m.
- The War of the Rebellion Official Records pg 184. - The military operations of General Beauregard in the war between the states pg 246. - The military operations of General Beauregard in the war between the states pg 259. - The military operations of General Beauregard in the war between the states pg 262. - The military operations of General Beauregard in the war between the states pg 236. Before our division lines were properly adjusted, Warren’s whole corps made a mad rush upon the works, now manned by a thin skirmish line and seemed determined to drive us from our entrenchments by sheer weight of numbers. But Kershaw displayed in inclination to yield, until the other portions of our corps came upon the field. After some hours of stubborn fighting, and failing to dislodge us, the enemy withdrew to strengthen and straighten their lines and bring them more in harmony with ours. About four o'clock in the afternoon Meade organized a strong column of assault, composed of the Second, Fifth and Ninth Army Corps, and commanded in person, holding one corps in reserve. The artillery of the four corps was put in position, and a destructive fire was opened upon us by fifty pieces of the best field artillery. The infantry then commenced the storming of our works, but Field's Division had come up and was on the line. General Lee had given strength to our position by his presence, coming upon the field about eleven o'clock, and gave personal direction to the moments of the troops. - The History of Kershaw's Brigade pg 381. General Meade had ordered an attack for four o'clock on the morning of the 18th but the new line of defense made it necessary to re-dispose the troops, and it was 3:30 P.M. before the assault was made. Warren's corps confronted Beauregard's extreme right, which was but a thin skirmish line, until Kershaw's division arrived with 5,000 men which then resisted the persistent attacks of Warren's corps. With the additional reinforcement of Field's division, and the presence of General Lee on the field, the Confederate troops were greatly encouraged, and with a force of about 20,000 men they repulsed Meade at every point. - The Soldier in Our Civil War: A Pictorial History of the Conflict pg 293. At about 7:30 in the morning on the 18th, Kershaw’s veterans arrived at Rives’ Salient in the Confederate works, about one mile southeast of the Petersburg Water Works. There, Kershaw’s men occupied the right of the newly established Confederate interior line. By the time the Federals began a series of uncoordinated attacks, Kershaw’s Division, along with Field’s Division and Alexander’s Artillery were under their Army of Northern Virginia battle flags in the Petersburg trenches. Beauregard’s exhausted men did not need to see the red Army of Northern Virginia's battle flags with their blue St. Andrew crosses to recognize their comrades’ gaunt, hairy faces, many shaded by slouch hats. Major General Bushrod Johnson’s weary Division tried to raise a cheer of greeting. Instead, many of the men wept in relief. As they had done at the Wilderness on May 6 and at Spotsylvania on May 8, Kershaw’s veterans had again arrived in time to help stall a Federal attack. Location of Fort Sedgwick provided by George Fickett. 1 History of the 187th pg 96.